Thanks for all your texts, thoughts, and well wishes since Hurricane Sandy rolled through earlier this week. We've been inundated with images and news reports of all the damage in New York and New Jersey. I'm almost ashamed to report how well we've fared in my little pocket of Brooklyn. We never lost power and were spared the flood waters (although they were about a block away from my apartment building). A lot of downtown Manhattan is still without power (including my office) and the subways are still shut down, so I've been on a bit of an extended vacation. I've somehow managed to fit in some runs the past couple days and have surveyed lots of big trees down throughout Brooklyn, especially in Prospect Park. My heart goes out to those who are displaced or without power still or unable to get in or out of the city. Things seem to be getting back to normal a bit today, but I have a feeling the rebuilding will be slow. Stay safe, everyone! 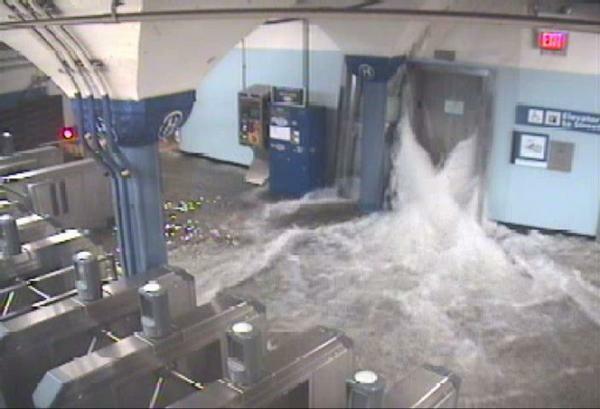 Flood waters pouring into a PATH station. Jane's Carousel in DUMBO (I was just there!). I haven't heard any reports on how it fared but hope it survived. Whether it was a good idea or not, we took a walk down to see the Gowanus Canal on Monday night. The flood waters here are all the way up to 2nd Avenue and 9th Street. Along the way, we also saw firefighters battling a warehouse fire in Gowanus. I'm in awe of all the city workers during this storm. Thanks for keeping us safe! Kurt and I went on my rooftop Tuesday night and a good chunk of lower Manhattan is still in darkness. Stay safe over there! The blog seems pretty trivial while all this mess is happening and so many of my fellow New Yorkers are in pain, so I'm taking a break for the week. I'll be back next week with some updates. In the meantime, consider making a donation to help the support efforts. Glad you're safe! Good luck this week as NY tries to get back to some sort of normalcy. Thanks for the update! Good thing you are safe. It's got to be weird in NY without transit and the lower half of Manhattan dark without power. 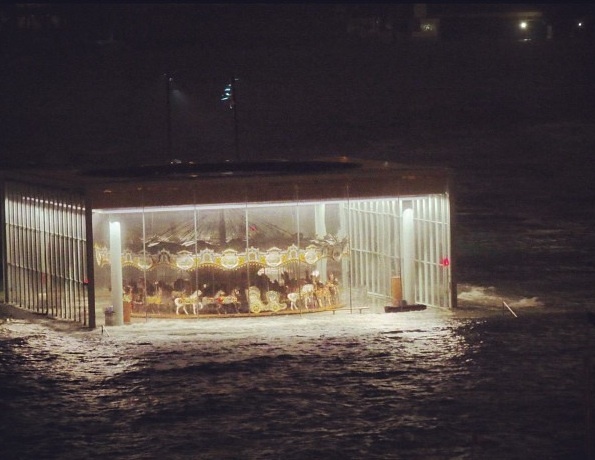 that carousel photo is insane. so glad to hear you're okay.